It’s safe to say that Swedish mainstream media “got blogs” in 2005. I predicted in November 2004 that blogs had broken through on a wider scale in Sweden as the number of articles about blogs in media increased significantly during that month. And the increase has continued during 2005. 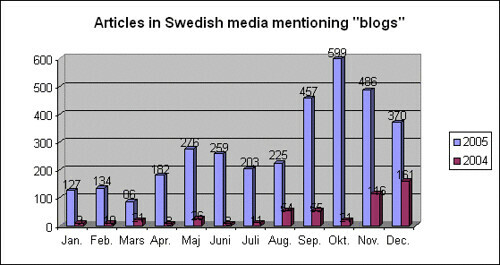 Swedish media wrote 500 articles mentioning blogs during 2004. This year we are up to 3,404 articles, that’s a 680% increase. – The pseudonymous blogger Mats Hård is revealed. – Journalist blogger Linda Skugge is nominated for Sweden’s grand journalist award (which she didn’t win). An interesting fact about these statistics is that Aftonbladet only published two (2) articles that included the word “blog” (in Swedish) during 2004. The very first Aftonbladet article available online this year is from 25 March 2005. Technorati tags: blog, media, statistics.